It's been a while since I wrote a single review on one product, what better than to start with than with one of my newest eyeshadow addition. 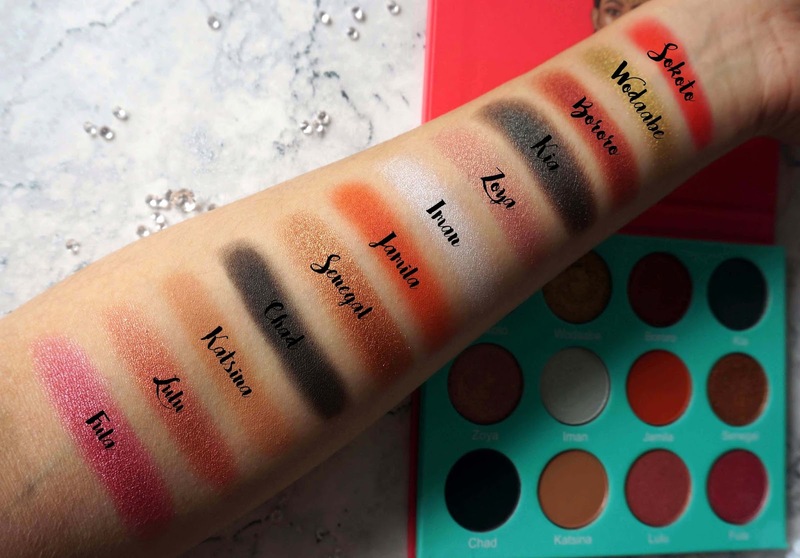 I have been deliberating whether to purchase the Juvia's Place eyeshadow palette for a while and when BeautyBay announced they stocked it, I bought it immediately (My sister actually paid for this as my birthday present) I decided to step out my comfort zone and opted for the Saharan Palette which is packed with vibrant shades. These shadows are encased within a sturdy pink and mint green cardboard packaging which makes it easy to identify when I have this in my drawer. It is also very slimline so it is easy to store and travel with. There is no mirror but I do not mind that and the names of the shadows are printed underneath which is really handy. There are 12 shades with a mix of matte and shimmer pigments. There are 4 matte shades; Sokoto, Jamila, Chad and Katsina and the other 8 are all shimmers. See breakdown below. The overall quality and texture of these shadows are A+, the matte shadows are pigmented, smooth to apply, buildable and have barely any kick when you actually use these with an eyeshadow brush.They have long lasting power (I use an eyeshadow primer every day) and stays vibrant all day. I've described some of the shades as a metallic foil finish: Wodaabe, Kia, Zoya, Iman and Senegal - these feel different when you swatch them, they are extra creamy and has almost a 'wet' feeling. Again very pigmented, hardly any fallout and easy to use. My favourite colours are Kia, Iman, Senegal and Katsina. Kia such a beautiful dual toned colour that looks different in the light. Iman is a lovely inner corner highlight especially when I use purple as a crease colour. Senegal a true copper which you know is my favourite tones to reach for and Katsina a beautiful transitional colour from the palette and is the shade I use with all of the other colours. Price wise when I purchased this off Beautybay it was £28 and for some reason now it is £30. These shadows work out under £2.50 each and for the quality, you need to give these a go. I am glad that I opted for the Saharan since it's nothing like what I currently have in my collection - I can't wait to experiment with more of these colours. The shades in this look amazing, I've been debating picking up this palette for myself - might have to just bite the bullet and do it!